Tomorrow, April 6, is the 100th anniversary of the United States’ entry into World War I. Europe erupted into war in 1914, but President Woodrow Wilson pledged neutrality for the United States. But following a number of German attacks on civilian ships—killing American citizens, Congress voted to declare war on Germany. The U.S. officially entered the war on April 6, 1917. The Ball State University Libraries GIS Research and Map Collection (GRMC) created this exhibit (above, click to enlarge) to commemorate this date in history. 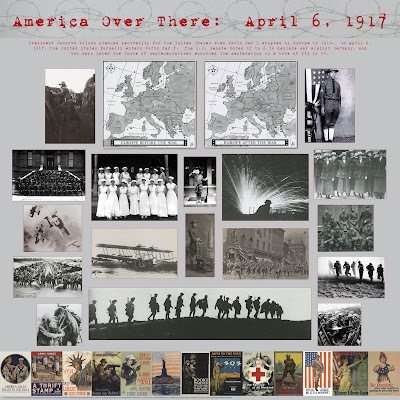 “America Over There: April 6, 1917” includes maps showing the country borders of Europe before and after the war. Photographs from atlases in the Atlas Collection and from the Digital Media Repository (DMR) are also included in the display. And patriotic posters from the Elisabeth Ball Collection are also shown. The exhibit is in the windows of the GRMC on the east side of the second floor in Bracken Library. The GRMC also provided World War I-era maps for a collection in the DMR. The New York Times World War I Maps includes a set of five maps that connect to create a larger map of the Western Front in France, the Netherlands, Germany, and Belgium. A rare historic map of Hungary created for use at the Treaty of Trianon at the end of the war is also available for viewing in the Archives and Special Collections in Bracken Library. For more information about using historic resources from the University Libraries collections, please contact the Archives and Special Collections at 765-285-5078 or the GRMC at 765-285-1097.